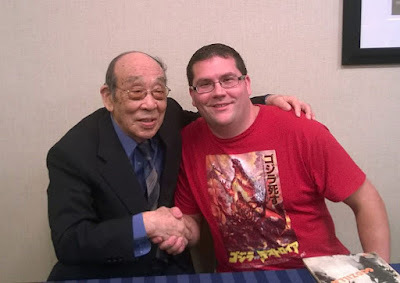 THE B-MOVIE NEWS VAULT: Goodbye Godzilla: Suitmation legend Haruo Nakajima has passed on. Goodbye Godzilla: Suitmation legend Haruo Nakajima has passed on. It is with a heavy heart, that I bid farewell to actor Haruo Nakajima, who passed away yesterday at the age of 88. 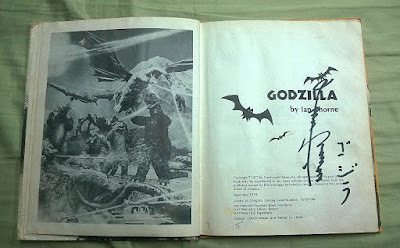 Starting out as a little-known actor playing bit parts, Nakajima eventually cemented himself as a staple of kaiju movies, with the release of 1954's GOJIRA. As the first person to ever climb inside a Godzilla suit, Nakajima instantly became a trailblazer, and would continue to portray the King of the Monsters in eleven more Showa era films. But his bragging rights do not stop there: Nakajima-san was also the first to don the suits of other popular giant Japanese monsters, including Rodan, Mothra, Mogera (in THE MYSTERIANS), Varan, Baragon, Gaira (the Green Gargantua), and Gezora (from SPACE AMOEBA, aka YOG: MONSTER FROM SPACE). As a lifelong Godzilla fan, I've managed to get my paws on tons of collectibles featuring my favorite mon-star. But all of that stuff (movies, soundtracks, action figures, Christmas ornaments, comic books, posters, etc.) pales in comparison to meeting Haruo Nakajima in person! It's an experience that I shall treasure always! I could barely contain the joy of meeting my childhood hero! I met Nakajima-san at Chiller Theatre in October 2014. Despite the fact that I had to get up early and drive to Parsippany, NJ, I foolishly attended a 35mm EVIL DEAD film festival the night before in Syracuse, NY. Because of this, I was running on approximately three hours of sleep on my way to Chiller. Once there, I waited in line for an agonizingly long period of time, just to get into the hotel. Then I waited nearly two more hours just to be in the same room as Nakajima-san, as well as Kenpachiro Satsuma and Tsutomo Kitagawa, two other notable Godzilla performers. In the end, it was well worth the lack of sleep and long lines, because I got to meet a living legend! I was able to shake the hand of the surviving member of Godzilla's "Founding Fathers, which at one time also included the amazing quartet of Director Ishiro Honda, Producer Tomoyuki Tanaka, Composer Akira Ifukube, and Special Effects Supervisor Eiji Tsuburaya! Nakajima signed my old Ian Thorne Godzilla book (which he seemed to puzzle over for a moment), and gave me a quick photo op. But before parting ways, I issued him a heartfelt thanks for bringing me hours upon hours of joy during my tumultuous childhood. Although I'm not quite sure he understood everything I said, there was no mistaking my excitement and enthusiasm. (Unbridled joy is a universal language!) Sadly, this would end up being the first and last interaction I would ever have with Nakajima-san. I will treasure this always! While that realization fills me with sorrow, I take solace in the fact that I had the opportunity to meet one of my heroes. On top of that, Nakajima-san's filmography is readily available, so we can continue to enjoy all of the films that he starred in as our favorite kaiju characters. As long as we keep Haruo Nakajima's memory alive, he will never truly be gone, and we can continue to enjoy, and share, his legacy with newer generations! Goodbye now Godzilla, Goodbye now Godzilla, until then. Take care now Godzilla, take care now Godzilla, my old friend. Sayonara till we meet again. To Haruo Nakajima's family, friends, and fans, please accept my deepest sympathies in your time of mourning. But take heart knowing that he was well-loved, and will long be remembered for his contributions to (kaiju) cinema. The VAULT-CAST returns with two new episodes!